If in your later years you’re coming around to the idea of yoga, like me, you may have your reservations. The images that circulate social media of toned bodies supporting their entire body weight on one hand may be designed to inspire, but in my case it’s more of a curl up in a ball response! What I would say is this: ignore the perfect yoga images. Yoga as a practice has the flexibility to be personalised and adapted to each of our physical abilities. A good yoga teacher should allow the student to progress at his or her own pace. Yoga is both simple and tricky. Remembering the sequence of movements used in the Sun Salutation comes through watching an expert and repetition, which is why it might help to take yoga classes and use books and videos as backup. The advantage of taking a class is that the teacher can give you personal attention and will recognise when you need to take it easy. From a personal perspective, I had to trial a lot of classes before I found the right yoga teacher; one who was gentle, kind and didn’t raise an eyebrow when I wobbled and groaned. I recommend reading 10 Tips for Starting Yoga After Age 50 by Beth Spindler, because she has a head screwed on approach to getting started at our age. If you are a fan of YouTube videos for learning, then Yoga with Adriene is a channel that gets good reviews, and I was instantly drawn to Grazia magazine’s The 5 Least Annoying Yoga Instructors on YouTube, because you definitely don’t want an annoying teacher of anything. Particularly with something that’s meant to relax you! What might you hope to get from joining a yoga class? Do check with your doctor before starting a class, especially if you suffer from any chronic conditions or have been very inactive for some time. The Top 10 Health Benefits of Yoga covers the physical benefits, such as better balance and support for joint health. Yoga is also said to help with mental health, reducing stress and aiding calmness and self-confidence. You may find that classes are not billed as being for the over 50s: look for something that says it teaches beginners, or ‘yoga basics’. Some classes are also adapted to practising yoga in a chair for those who are less mobile. There is a multitude of yoga styles, which can cause confusion. This article Before you Start Yoga for Seniors by Ann Pizer, suggests that Hatha and Iyengar are the best ones. The more athletic yoga styles, like Bikram and Ashtanga are probably best left until you feel proficient and confident in your practice. Clothes that are stretchy and comfortable also help to make the class more comfortable. Keep in mind when choosing what to wear that many movements in yoga classes require bending forward and lying down. Leggings and a roomy T-shirt are just fine; there’s no need to spend a fortune on fashionable yoga wear. Don’t be afraid to start a class because you have a specific medical condition. Be honest with the yoga teacher and they will adapt the poses to your abilities. Look for a class that gives you a bit of everything; movement, breathwork and meditation. Also, warm ups are your best friend at our age: the older body needs more time to loosen up, so look for a teacher that understands this. 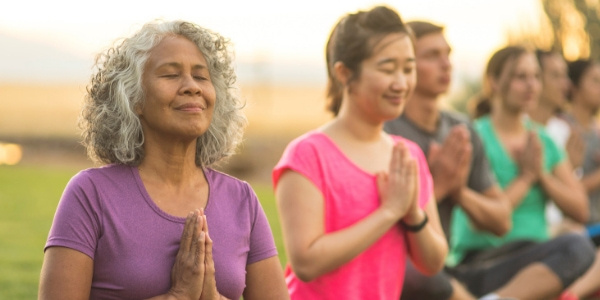 Finally, here is a ‘Find a Class in Your Area’ resource from the British Wheel of Yoga – try a class at least once, you never know, you may find you are a yoga whizz kid over 50.